Whether you are looking for a quick snack or a simple way to get more vitamins and nutrients into your daily routine, Dr Gaye Super-Blend is a protein shake powder that has it all. Packed with 14 raw ingredients and containing less than 40 calories per serving, Dr Gaye Super-Blend will give you your daily quota of vitamins, minerals, and micro-nutrients and leave you feeling great! The best part is that you can make it anywhere and with almost anything. Just carry a few portions of this amazing protein shake powder wherever you go and mix it into a glass of milk or juice or even a dish of yogurt. Thanks to the completely organic and raw superfood ingredients, it tastes great and, when included in your daily diet, can improve your vitality and lead to clearer skin, fewer mood swings, happier thoughts, and fewer sugar cravings. 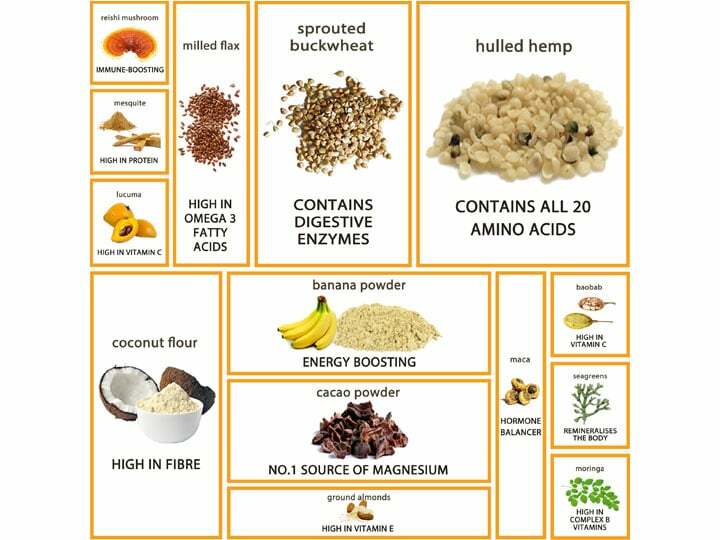 How is Dr Gaye Super-Blend Different? With so many protein shake powders available, you might be wondering what sets Dr Gaye Super-Blend apart. When you are looking for a healthy snack, you want something that is high in protein and food-grade micro-nutrients, vitamins, and minerals. That’s why all Dr Gaye products are full of natural, raw ingredients that are unsweetened and unprocessed. Although adding roasted nuts or oven-baked ingredients can often sound tasty and nutritious, the truth is that cooking or processing food changes the availability of the vitamins it contains. This results in it being harder for your body to process the vitamins. 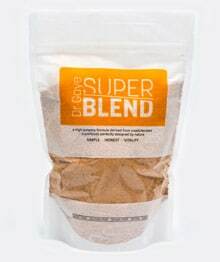 Dr Gaye Super-Blend uses only the finest raw ingredients to ensure that your body can easily absorb all of those important nutrients, making it a uniquely powerful protein shake powder. Sprouted Buckwheat: Buckwheat, despite its name, is a fruit seed (related to rhubarb and sorrel) rather than a cereal grain. It is high in magnesium and flavonoids and has been shown to help lower cholesterol, high blood pressure, and blood sugar levels. It is also known for helping you to feel fuller for longer. Ground Almonds: These tasty nuts contain high levels of protein, fiber, vitamins E and B, and magnesium. Coconut Flour: Coconut Flour is high in fiber and protein, as well as being a good source of vitamins C and B1 and iron. Flaxseed: Flaxseed contains alpha linolenic acid, an omega 3 fatty acid, which has been shown to help normalize bowel function. Banana powder: Banana powder is high in B6, vitamin C, potassium, manganese, and magnesium. Maca: This Peruvian plant is a superfood that has been linked with lower blood pressures, decreased levels of stress and anxiety, improved libido, and has been shown to balance hormones and help with PMT. Lucuma: Lucuma is a Peruvian fruit that contains high concentrations of calcium, phosphorus, beta-carotene, Vitamins C and B3, fiber, iron. It tastes a bit like maple syrup and operates as a natural sweetener. Cacao: Cacao is high in Sulphur, which is associated with healthy nails, hair, and skin and also helps to detoxify the liver and supports healthy pancreas functioning. It is also an excellent source of magnesium, which has been linked with balancing brain chemistry, healthy bones and teeth, and higher levels of happiness. Seagreens: This British brown seaweed contains a full spectrum of micro-nutrients that can help remineralize the body. Mesquite: Mesquite is a good source of vitamins A and C, fiber, protein, calcium, iron, lysine, manganese, zinc, and potassium. Reishi Mushroom Powder: Reishi mushrooms contain beta glucan, which can help boost your immune system. They are also an anti-inflammatory and contain ganoderic acid, which has been shown to ease the symptoms of allergies. Boabab: Boabab is a fruit that contains vitamin C, calcium, magnesium, zinc, potassium, bioflavonoids, and provitamin A. It is a natural prebiotic, which can help promote the growth of healthy bacteria in your gut. Moringa: The moringa plant is a good source of vitamin C and many B-complex vitamins, including folates, vitamin B6, thiamin, riboflavin, pantothenic acid, and niacin. Hulled Hemp Seeds: These seeds are high in protein and contain all 20 amino acids, high amounts of fatty acids and fiber, and vitamin E. The Omega 6 Linoleic Acid and Omega 3 Linolenic Acid it contains have been connected with cardiovascular health and improved immune system functioning. Dr Gaye Super-Blend is easy to use. Simply sprinkle 10g (about 1 tablespoon) of the protein shake powder in a drink or over a food of your choice. Stir and enjoy the delicious taste and amazing nutritional value. Give it a try and discover the incredible health benefits of food-grade vitamins and nutrients from raw, organic ingredients! Dr Gaye offers a range of non-dairy healthy shakes, blends, mixes, and snack products that are delicious, nutrient-packed, and easy to prepare so that they can fit into your busy life-style. All Dr Gaye products contain raw, unprocessed ingredients that are full of the bio-available (easily absorbed by your body), food-grade vitamins and nutrients that you need to stay healthy. All of their products are also organic, grain-free, gluten-free, sugar-free, and dairy-free. They make a great addition to special diets, such as Paleo, raw, 5:2, Bullet Proof, and alkaline and are perfect for every member of your family.